2007 Team World Champion, Ivana Hong is now a sophomore at Stanford. 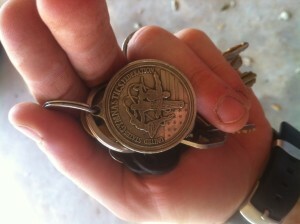 Photo courtesy of Stanford University. This week we talk to toe-point champion of the universe, Ivana Hong. She was a member of the 2007 gold medal winning World Championship Team and won a bronze medal on balance beam at the 2009 World Championships in London. We ask what she learned from each coach she had during her elite career, if she will join Cirque du Soleil or return to elite after college, what advice she’d give her younger self, what it takes to be so tranquil on beam, and how she learned to be so very very elegant. We tell our favorite drunken and/or it-can’t-be-that-hard gymnastics wipeout stories, talk about NCAA conference title meets, Jesolo, Cottbus, and French nationals. Plus our favorite British Olympian, Jenni Pinches, joins us to talk about the British Championships. Check out her blog for full details with videos. Don’t forget to tweet #SendJenniToMoscow to @BGMediaTeam and DFTBA! The most perfect double front of all time, as performed by Ivana Hong. Ivana at the 2012 NCAA’s Team Finals. 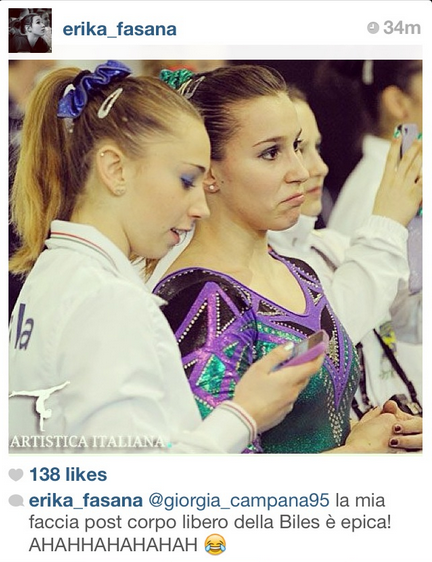 Italy’s Erika Fasana posted a photo of her face after seeing Biles perform. 30 year-old, 2000 Italian Olympian, Adriana Crisci, competed AA for Italy’s B team at Jesolo! Adorable and powerful Jr. Brit Louise McColgan’s floor routine from British Championships. 2003 Balance Beam World Champion Fan Ye, is in the United States to promote the 2014 World Championships in Nanning, China. We talked to her about the quality of education at the national training center, her university studies, how the loss of the 10 effected her personally along with the current code and the current state of Chinese women’s gymnastics. We owe a special thank you to national team coach, Jiani Wu, for interpreting despite having a bad case of laryngitis! Follow Fan Ye on Webo. Blythe gives us a behind-the-scenes report from France where she covered the French International, we discuss the crime against gymnastics that was the Utah vs Florida meet, and our most memorable gymnastics related show-off accidents. Enter our contest! Five of you will win TWO tickets the Women’s NCAA Championships hosted by UCLA in April. All you have to do is like us on Facebook or follow us (by adding us to one of your circles) on Google+. For more information on the meet, visit ncaa.com/gymnastics. 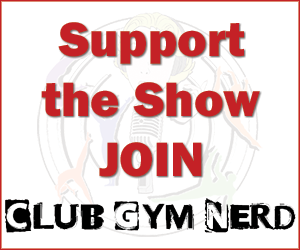 Thank you for asking how to support the show! By popular demand, we now have a donate button! Holland America’s Dancing With The Stars Cruises featuring Shawn Johnson. Get a Grip Gymblog on NCAA mess this past weekend, Judge Well, Lest Ye Be Judged. Fan Ye in her favorite blue leotard from the 2005 Chinese National Championships where she won the all around. Tweet of the Week from Catalina Ponor. This week we chat with one of our favorite gymnasts, Sho Nakamori. He made the national team at 12 and lived through both personal tragedies and injuries more common in car accidents than gymnastics, before reaching his peak. His experiences as a gymnast, the son of Japanese gymnasts and a grassroots contributor to the community have always fascinated us. He proved to be as much of a renaissance man as we had imagined! He’s traveling through Japan right now, follow his adventures on Twitter. Illinois head coach, Justin Spring, stopped by to give us the lowdown; the good, the bad and the ugly after hosting a trial run of the highly controversial match-play format meet this weekend against Minnesota. For more info on this format, check out our interview with him from December in episode 13 or a review of the meet on Uncle Tim’s site here. Jess addresses the very common but rarely discussed issue of Stress Urinary Incontinence in gymnasts. This is when you accidentally tinkle when you tumble. She gives some prevention exercises. Check out vagacare.com for more info. 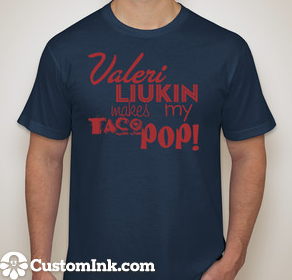 Valerie Pops My Taco T-Shirt available for $29. Click on the picture to rock this gem! Our favorite mini-trickster, Mai Murakami’s triple twisting double layout. And more Mai, because you can never have enough Mai! Tony Retrosi from GymMomentum does some gymnastics stand up comedy at an ALS benefit. 5’9″ Iowa Freshman, Sara Townsend on bars. Next episode – mini documentary called Samurai Soul (we think) on Kōhei Uchimura showing his daily routine and training! 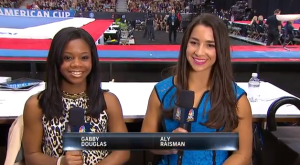 Gabby Douglas and Aly Raisman, hanging out on the sidelines at the American Cup. What a difference a year makes. Last year, the American Cup was held at Madison Square Garden to a near capacity crowd with former champions—Mary Lou Retton, Carly Patterson and inaugural winner, Nadia Comaneci—in attendance. Bela Karolyi had emerged from his between-the-Olympics hibernation to mutter indecipherably for the cameras. Gabby Douglas, in a sign of things to come, unofficially won the all-around competition, beating the favorite and defending world champion, Jordyn Wieber. Fast forward one year to the 2013 American Cup held this time in Worcester to much less fanfare. The “Fierce Five” were arguably the biggest story coming out of the London Olympics yet none of the stars competed. Can you imagine Tom Brady winning the Super Bowl and not playing on opening weekend the next season? We might’ve seen the frontrunners for Rio, but the Olympic team’s absence from this year’s American Cup illustrates why gymnastics will only be popular in Olympic years, even as it tries for greater multi-year popularity. But as I watched the competition, I understood why other sports not oriented towards one specific competition that takes places once every four years have more of a shot at year-round popularity. First, there is the lack of continuity. After the Games, many athletes retire or take time off. Though Gabby Douglas and Aly Raisman were present for press and fans, they did not compete. Douglas announced that she is set to return to training in Iowa in May; Raisman would not put a date on her return to competitive form. Certainly it won’t happen before her run on DWTS ends. Kyla Ross had originally been slated to compete, but withdrew with a bruised heel (she performed an exhibition routine after the meet concluded). 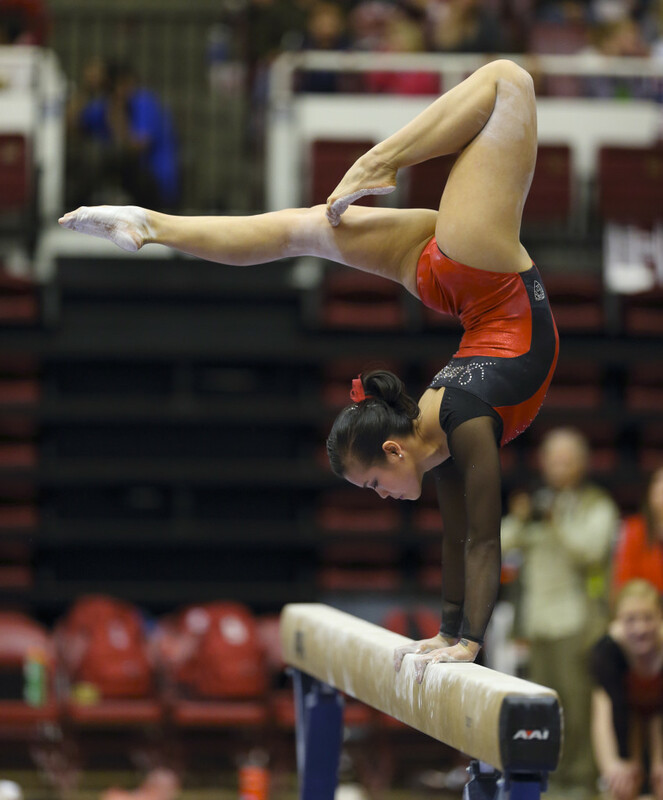 Olympic gold medalist, Kyla Ross, performs an exhibition beam routine, after the meet. Also, every four years the rulebook of gymnastics changes. Spectators who might’ve come to understand the scoring by the time the competition in London ended will have to learn a new set of requirements if they wish to follow the meets in the next quadrennium. That’s a big investment of time and energy. Only the hardcores are willing to go that extra mile. 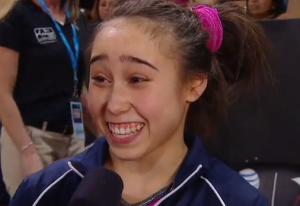 American Cup champion, Katelyn Ohashi. Other popular sports thrive on sameness. I watch exactly one football game a year—the Super Bowl—and yet I know what’s going on each time I tune in. A touchdown, a field goal, a first down—they’re all as I remember them from the previous year (and worth the same number of points). The game appears unchanged to the untrained eye. And for other popular team sports, all you really need is an untrained eye to follow what’s going on. And though every year brings some new rookies, enough of the older players remain so fans aren’t expected to learn a completely new roster each year. There is continuity—both with the rules and stars—from year to year. This lack of continuity isn’t the fault of USA Gymnastics or any of the individual athletes. After years of intense training, it is understandable that the gymnasts would want to take time off and enjoy all of the opportunities that come their way. The window for gymnasts making money off the sport is very limited so they must take advantage of it immediately. They might also need this downtime in order to let their bodies recover from the brutal Olympic preparation process. Nearly every gymnast is competing with some form of hurt. The gymnasts can take a break, comforted by the knowledge that this year doesn’t actually matter, in the Olympic scheme of things. And therein lies an additional problem—the fact that one year in four has drastically lower stakes than the rest. Without stakes and drama, you lose excitement and quite possibly, the audience too. 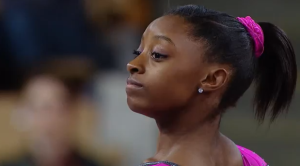 Superhuman, American Cup runner-up, Bannon’s Simone Biles. Even the athletes acknowledged the lowered stakes in their post-meet interviews. All seemed particularly focused on testing out new skills and routines for the coming years. Competing them perfectly, while desirable, wasn’t their top priority. 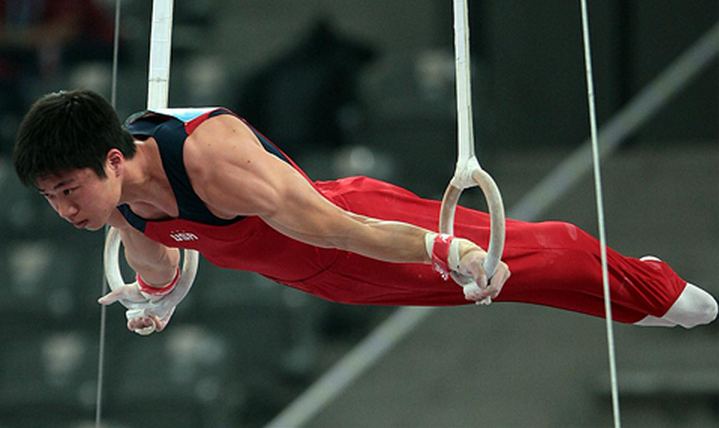 In gymnastics, 2013 is sort of like a year-long preseason. Will Ohashi and Biles be in Rio in 2016? While I would love to see both girls (and especially Ohashi’s dimples) in Brazil, looking towards the Olympics in the year after the previous Games is like trying to pick an Oscar contender in March. (In that case, I would’ve gone with 21 Jump Street.) It’s not exactly the right time to be placing bets. The greater question is how can a sport that is arguably the most popular during the Games transcend the Olympics and become popular in its own right? Or is gymnastics virtually nothing without the Olympic Games at the end of the four-year tunnel? Dvora Meyers is a freelance writer who’s work has appeared in The Atlantic, Slate and Deadspin. Follow her at Unorthodox Gymnastics. 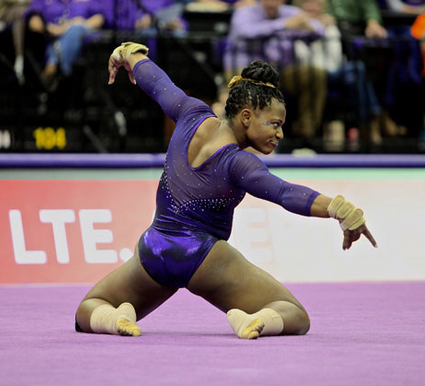 This week we talk to LSU’s Lloimincia Hall who is currently ranked second on floor in the NCAA. She and her coach, D-D Breaux talk about conditioning, gospel floor routines and preparing for hurricanes. Lloimincia’s interview prompts us to talk about religion, inclusion and persecution within the gymnastics community. Dvora gives us a ringside report from the Nastia Liukin and American Cup meets, then we chat about our favorite routines from the Russian and English championships. Lloimincia Hall vs Florida in January 2013. Be sure to check out LSU’s web-series Inside LSU Gymnastics.